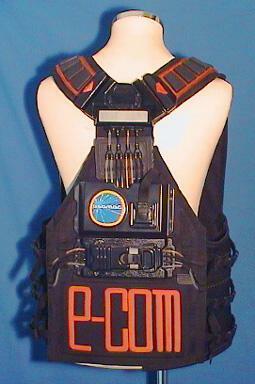 This Hollywood prop costume was up for bid on eBay on July 2, 2001. I have 2 original space costumes of William Hurt, and the jump suit worn by Lacey Chabert. As well as the original blaster gun, and drawings. This wardrobe item was worn in the "Lost in Space" movie in 1998. 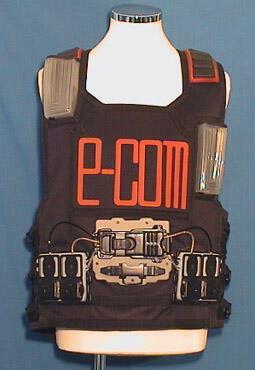 The "E-COM" vest was worn by the maintenance crew during scenes, when the Jupiter-2 is still on earth. The E-Com wording does not appear on the costume. This is from the sequence when Major West (Matt LeBlanc)is to be shown around the ship, and several of the crew can be seen wearing the vest.